Early people used candles and oil lamps for light (often from whale oil). Crude incandescent lights were made in the early and middle 19th century but had little use. Improved vacuum pumps and better materials made them shine longer and brighter late in the century. Electric generator stations brought electricity to urban and later rural areas to power them. Later gas discharge lights, including fluorescent lights, use less electricity to make more light. The incandescent light bulb turns electricity into light by sending the electric current through a thin wire called a filament. 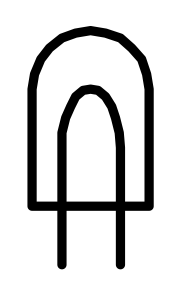 Filaments are made up mostly of tungsten, a metal. The resistance of the filament heats the bulb up. Eventually the filament gets so hot that it glows, producing light. An LED is made like electronics. It is a chip of semiconducting material, usually silicon. LED bulbs are more efficient and last much longer than either incandescent or fluorescent bulbs. Unlike fluorescent bulbs, LEDs do not use mercury, which is toxic. Until recently LED bulbs were not as bright as the other kinds of lights, and cost more too. Most light bulbs fit into a socket. If the socket is turned on, there is electricity there, even if the bulb is out, so there is danger of electric shock. Most bulbs get very hot when they are turned on, and take some time to cool off. Most light bulbs are made of glass, which means that they can break easily. Fluorescent bulbs contain a small amount of mercury, if they break, be careful to not breathe the mercury vapor. 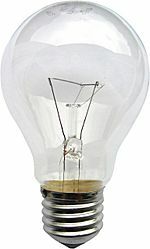 With all light bulbs , the filament will eventually break and the bulb will need to be replaced. Light bulb Facts for Kids. Kiddle Encyclopedia.